At the forefront of modern space exploration looms the possibility of manned missions to Mars. From the ambitious schemes of Elon Musk, to NASA’s hopeful plan, to the collaborative endeavor of the ESA and Russia, it seems as though every major space agency is making strides towards putting humans on Mars. But, on a cold and desolate planet whose minuscule atmosphere is severely lacking, how do you sustain human life for long periods of time? Many scientists and science fiction enthusiasts have, over the years, speculated at the possibility of terraforming Mars. Finding innovative ways to make the surface of the red planet gradually more conducive to human living. There have been many ideas and models created in the hopes of successful terraforming. Engineers designed a shell that could be placed around a small planet which could protect the planet from radiation and help to facilitate an atmosphere over time. Others thought that by breaking apart the martian crust they could release enough CO2 to build up an atmosphere. There have been many attempts, but the issues of cosmic and solar radiation paired with the unsurvivable atmosphere and dry terrain are always too much. 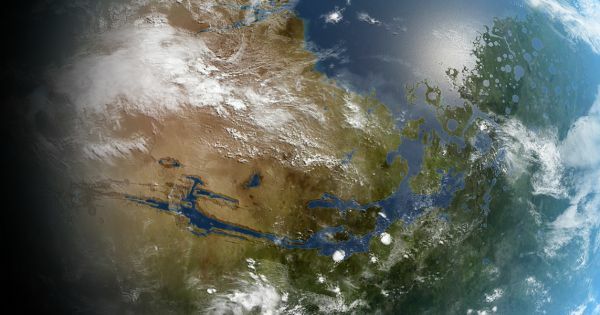 And, while the concept of terraforming Mars isn’t completely impossible, to successfully do it you would need to protect against cosmic radiation, solar radiation and solar winds, increase planet temperature, add oxygen and nitrogen to the atmosphere, and do all of this in a way that could be self-sustaining. Not impossible, but currently posing serious obstacles. Despite all of these hurdles, scientists have not stopped trying to find inventive ways to terraform Mars. NASA recently proposed a unique strategy that shows a promising solution that could address some of these issues: a magnetic shield. Since the current scientific consensus is that Mars’ atmosphere was lost because of solar winds and the disappearance of the planet’s magnetic field, this solution shows promise. Mars’ magnetic field once protected the red planet while supporting an atmosphere (and moisture), and NASA scientists think it can be artificially restored. The research team working on this idea recently conducted a simulation with their artificial magnetosphere, thanks to the Community Coordinated Modeling Center (CCMC). They found that their dipole shield would be able to protect against solar wind and help to balance the Martian atmosphere. Because the shield would work as an artificial magnetic field, the atmosphere would actually continue to thicken over time. This could be just another stepping stone in a long line of terraforming concepts, but this solution holds concrete possibility. Because it could help to actually create a better atmosphere over time and can actually be simulated within a lab, it is possible that the future of terraforming will begin with magnets.